I agree with the mayor's decision to scratch the streetcar proposal. Like him, I came to see it as an interesting idea, but essentially a distraction from the more important proposal of a regional commuter rail plan, governed and financed by a regional transportation authority. I support the idea of a regional commuter rail system. I live on Madison's East Side but work in Middleton. If this system was built, I would use it every day, and so would several co-workers. It would decrease traffic and annual repair work on the Beltline and other major east-west roads, reduce the need for parking structures and help knit together the communities of Dane County. Commuter rail is the answer. Something a little more elegant and creative is needed. We cannot simply keep widening and fixing our roads at higher costs each year. A common sense look at a Dane County map virtually screams: "expanded bus service i- yes; commuter rail - no. Commuter rail works well on the Eastern seaboard, where New York City, a huge job center, is flanked by a long, narrow corridor of high density suburbs. An average New Yorker's rail commute might run 40 or more miles, one way. In Dane County we are spread out, at fairly low density, in all directions around our lakes, and most people prefer to keep it that way. Buses are the obvious public transit solution here. I would support a regional transit authority with a focus on buses, especially electric hybrid buses. Hybrid buses average 30 percent to 40 percent better fuel economy than diesel buses, and since they accelerate using electric power, they cut typical diesel emissions by around 90 percent. Hybrid buses are still more expensive than their diesel counterparts, but since they are heavily used, even the present cost penalty is usually recouped, and then some, in fuel savings alone, during a bus's operating lifetime. Perhaps most important, federal money is available for buses, not just commuter rail. Bus money can come from the Department of Transportation, and for hybrid buses, also from the Department of Energy and the Environmental Protection Agency. Responsible policy makers should have made the public aware of this a long time ago. As an advocate for intercity passenger trains, I support the proposal for commuter trains in Dane County. I believe both are necessary for the future of Madison and Dane County. Intercity passenger trains and commuter trains will necessarily share tracks, stations and dispatching. As each are planned, the responsible agencies must recognize the needs of the other. In addition, the needs of the freight operator, the Wisconsin and Southern, must be recognized. From my brief discussions with planners, I believe this has already happened and will continue. For those leery of the capital investment, consider the long-term value. If properly designed, constructed and managed, these facilities are likely to serve Madison and Dane County very well 50 years from now. We are fortunate that most of the railroad lines constructed here over 100 years ago are available today. We owe a debt to those in state, county and local governments wise enough to hold on to irreplaceable assets. 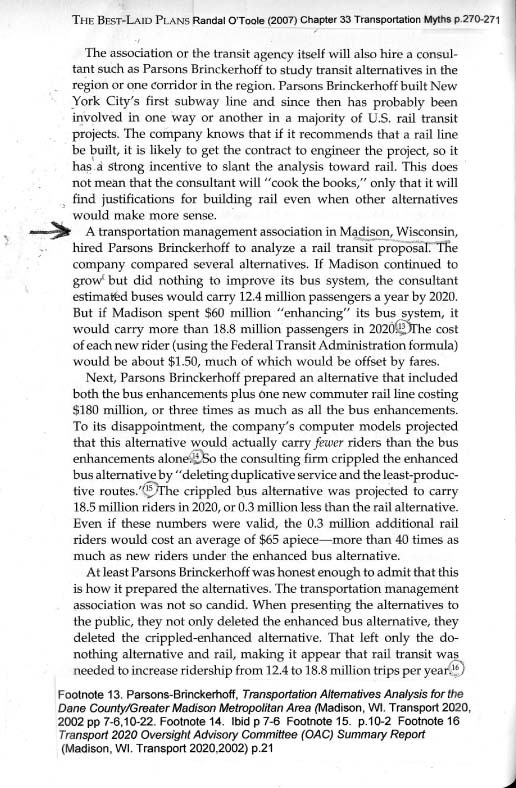 Dane County doesn't need commuter rail. Other communities that have built rail systems continue to experience traffic congestion without experiencing greater economic growth than Wisconsin's fastest growing county. Those communities also have the burden of covering their systems' operating deficits, making them less competitive than ours. We are told that the Regional Transportation Authority will address the rail system costs with a half-cent sales tax. Dane County already has such a tax, used to build the jail. With the jail completed, how about using that tax to fund transportation improvements? Why invest additional taxing authority in an undefined RTA and the same group that shifted the "jail tax" to other purposes? On Sept. 1, our transportation corridors will be clogged as 70,000 badger fans head to Camp Randall, even though these fans will be car pooling and Metro Transit will be augmented with private sector buses. A week later, with the Badgers traveling, those fans will be watching from dispersed locations, causing no congestion. Large congregations of people are the cause of congestion. Why don't we follow the path less traveled and look to disperse our growth throughout the county, thus spreading the wealth and avoiding the congestion? Why do some towns oppose a good idea? I support Dane County commuter rail. I live in the city proper, and there are many shops, festivals, restaurants and bars in the surrounding communities that I would be able to more easily frequent by rail. Do you think there are people in Waunakee or Sun Prairie who think this way about Stoughton or Cross Plains, too? I'm confused about why some communities are against an idea that has the potential not only of allowing its residents who work in Madison to get into the city easier, but also of seeing an increase in revenues from an influx of visitors. Now that streetcars are no longer an issue, I hope the xenophobia and bruised feelings of some community leaders who feel "snubbed" by "not being properly included" in Mayor Dave Cieslewicz's and Dane County Executive Kathleen Falk's conversations won't cause us to miss a great opportunity. It's time for Dane County to use some common sense. The only viable solution to our transportation concerns is to start building a rail network, as every moderately-sized city in Europe realized years ago and most moderately sized North American cities are realizing now. In the short term, it costs money to get up and running, but in the long term it would make money through fares. Electric trains are much better for the environment than thousands of cars sitting on the Beltline all day, and they would eliminate the frustration of sitting in traffic jams. Those who have never experienced the efficiency of train systems in Boston, Berlin, Stockholm, Munich or Stuttgart should consider taking a vacation to try it out before complaining about set-up costs. The real issue should not be whether to build a rail system, it should be how big we should start with. Lines coming from Sun Prairie, Cottage Grove, and Stoughton and McFarland could converge at an East Station, preferably the airport, since this would also encourage people to use our airport. Lines coming from Cross Plains and Middleton, Verona, and New Glarus (through Oregon) could meet at a West Station. A ring line around Lake Mendota (through Waunakee) and Lake Monona could connect the East and West Stations, continuing through the Isthmus. Add a park-and-ride lot in each town, and this system would be convenient for just about everyone in Dane County, which is the most important factor. One day, perhaps, rail will be needed, but presently, no. The plan as presented takes care of Middleton, Sun Prairie and employees of the University of Wisconsin and University Hospitals. How will other communities be served and when? A plan to integrate the rest of Dane County hasn't been presented. Begging the question, has it been considered? Furthermore, nothing is being said as to how buses will integrate into this plan. We are being asked to buy into a Dane County rail plan, and the funding, without a comprehensive plan. As presented, we simply can't afford this idea. Mayor Dave Cieslewicz says the RTA will enhance life in Madison, but at what cost? The estimate for this rail service is $250 million, but it's wise to multiply estimates by four for the real cost. It could be $1 billion. And what about the cost during construction? University Avenue is a main artery and major retail strip in Madison. How much business will be lost when it's torn up constructing the route? How many small business's will suffer or close? Madison is already getting a reputation as a city that does not want small business. Cieslewicz may be choo-choo crazy, but something this important should be put to the voters in a referendum. Let the people of Madison vote yes or no for the RTA. Since a couple of mayors and decades ago, Madison has waged war on cars in the city. This time around with the RTA, the nanny-city and controlling county might be about to succeed. Imagine paying hundreds of dollars more in property taxes for a train you'll never use. 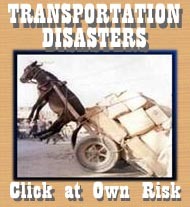 But even worse, imagine being slowed down on your daily trip to the inner city because trains have the right of way. How will you react when you see passengers from out of town co-opting that right of way, and trains as empty as the buses that already roll over most of the city? Won't you be tempted to move outside the county to avoid RTA taxes so that you can put your money into your personal choice - your car? Tell that to your city and county representatives before they effectively take away your choice. I would like to see commuter rail for Dane County derailed. A more immediate solution to the commuter problems in Dane County would be to expand the present bus services to outlying areas and increase services within the city. It would not take a multi-million dollar sales tax increase to accomplish that. First, thanks to those Dane County Board supervisors who took the time to write back expressing their views on the RTA. It's reassuring to know that some of you listen and do not simply vote for a pre-planned political agenda. I oppose the RTA not because I may be against commuter rail, but because I feel we as taxpayers are being railroaded into it. I would like to know: Is it true the Transit 2020 Committee was made up of mostly pro-rail members? Is it true that the Madison trolley is embedded in the 2020 plan? What would be the effect on the Beltline and University Avenue if there was a North Beltline? Why not test the light rail proposal by putting an express bus on the same route. The bus fare could be 50 percent of the rail fare. Give it six months, then discuss the need for a $250 million project. Questions like these must be answered so citizens who do not simply vote for pre-planned political agendas can make informed decisions. I don't want an increase in our sales taxes for the proposed commuter train system recently passed by the Dane County Board. There is no need for a train system in this county when the problem of transportation could be solved with a better bus system or a north or south bypass. This would be a more economical alternative than an expensive train system. Why would the County Board choose an expensive alternative that only 1 percent to 5 percent of the Dane County population would actually use, versus a less expensive plan that 90 percent or more of the population would use? Write your representatives in opposition to the RTA, commuter rail and the large sales tax increase. The city and county need to get their ducks in a row before they are given the opportunity to start taxing $42 million a year for commuter rail. Show the taxpayers they can handle the taxes they are taking now before they ask for more. How? First, they need to get their priorities in order. Give the police the tools they need so every neighborhood is safe before they consider bringing commuter rail to Madison. Then consider the county taking over Metro Transit and expanding it to serve all the communities that have a need for the service, include using vans and contracting out. Consider road construction that will divert traffic around Madison. Once ridership is established, do a cost effectiveness evaluation of a rail system. If it is determined that a rail system is needed and will have users, address all the taxpayers' concerns, lay out the phases of the planned RTA and how its board will be selected. Meanwhile, continue to plan ahead and take into consideration the rail system when planning new developments. Call it the Dane County Transportation Network until other counties hook up, then go for the RTA. As residents of Oregon, we think the Regional Transportation Authority is an unjust taxation area for those living outside of areas requiring mass transit. Mass transport should be supported financially by those in that area. Taxation of the entire county to primarily support any rail or trolley system is not justified. In any case, a bus system is much more economical and feasible. The proposal for light rail between Middleton and Sun Prairie is too expensive and will serve far too few people to be economical. My preference would be to extend Interstates 39/90/94 to Highway 12 in Middleton, thereby creating a loop around Madison to provide an alternative to the South Beltline and provide a safer route from the Northeast Side of Madison to Middleton than the current Highway 113 to County M to County Q.
I can remember the opposition years ago to building the Beltline through the marsh and for re-constructing Broadway. Can you imagine how congested Broadway would now be if we had gone that route? Let's do it right and build a north highway route, let traffic flow un-impeded and let travelers drive safely with off- and on-ramps, not stoplights and cross traffic. A look at a map of the U.S. shows that most larger cities are surrounded by a highway loop allowing for efficient and time-saving routes, not a hodge-podge of partial highways, light rail, park and rides, etc. The people of Dane County do not want the added taxes that this light rail will incur just to serve a few individuals. We already have a bus system that is working, is flexible and allows for adjustments to accommodate changes in demographics in and around the Madison area. Please, no more taxes. No expensive, inflexible light rail. And no to the RTA. There's bad news for those who ride the bus and like the convenience, price and efficiency. Transport 2020 and Regional Transit Authority people plan to remove the efficient Middleton-to-Madison bus line in favor of a feeder bus to the rail. To artificially boost the projected rail ridership numbers, the bus trip will "count" as commuter rail and make the ridiculously low rail numbers look better. In fact, after the train is in, any bus line that "competes" with the commuter rail will be converted to a feeder system to take riders to the train depot. No more near doorstep-to-workplace, 15 minute bus commutes for UW, Capitol or Downtown people. Now they'll take a bus, wait for the train, take the train and maybe take another bus to the final destination. That's a great example of efficiency in government. Why do they think people will use a more complex, expensive and time consuming mass transit than the present bus system? I think I'll start driving my car to work. When I was an engineering student in the 1950s, my co-op employer was GM's electromotive division, at that time the world's largest diesel-electric locomotive manufacturer. My lifetime interest in trains has included visits to several steam narrow-gage railroads, rail museums and other railroad attractions. In retirement, one of my hobbies is a garden railroad. I should be pro-commuter rail, right? I am not. To paraphrase the line from the baseball movie, "Field of Dreams," what if you build it and they don't come? We will then have millions of dollars invested in rail bed and rolling stock that will require a draw on taxpayers if ridership doesn't provide at least break-even revenue. A far more flexible solution is to expand the bus transit system, which can be rerouted to meet changing needs without laying down new tracks.